This listing is for the Flowers for Emma PDF pattern .After purchase, the PDF file will be available for download in your Etsy account. If you check out as a guest, you will receive an email with a link to the download. The Flowers for Emma quilt finishes at approximately 51" x 59". have started making this quilt love the hand piecing and the clear crisp design. Very easy and clear directions. I could look at this site all day! Very inspiring! Almost too much to look at! But, I found a PDF pattern I loved. Easy peasy. See it. Buy it. Have it. Thanks, hope to make soon! GORGEOUS pattern! 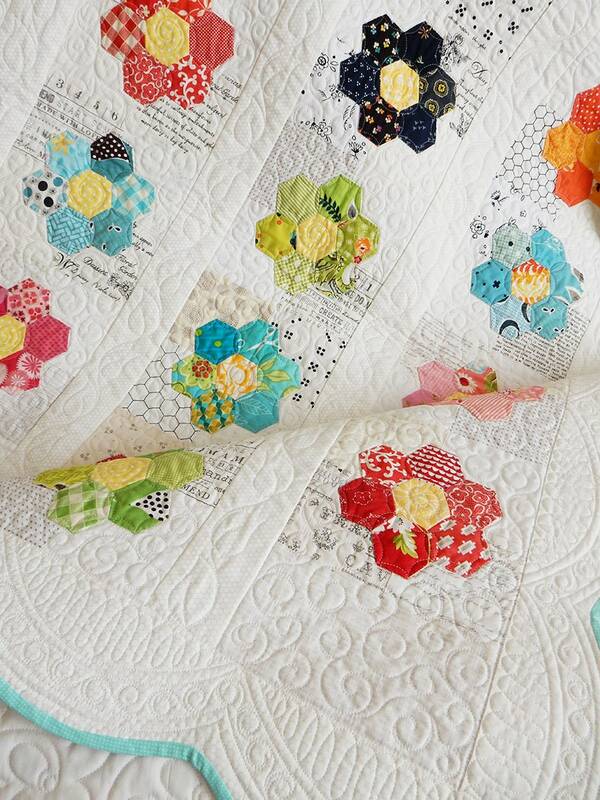 I saw this in a magazine and on the seller's blog and fell in love but couldn't find a pattern - I'm so excited about the blend of traditional hexies with a modern "low volume" background! If shipping is less than the listed price I will refund the difference. If you are purchasing multiple items I will combine shipping and refund any overages.